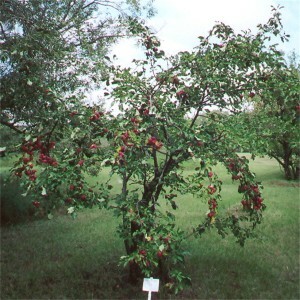 Crab Apples | Honeywood (Dr. A. J. Porter) Heritage Nursery Inc.
We found a couple of the RedHeart crab growing at the nursery and have since had a few trees grafted from the best one. RedHeart crab is now one of the Porter fruits growing in the Memorial Garden. 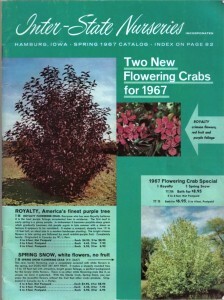 Spring Snow flowering crab – 1967 – introduced and patented by Inter-State Nurseries of Hamburg, Iowa – Featured on the front page of their ‘Spring 1967 Catalogue’ – their description – SPRING SNOW, white flowers, no fruit – T 68 Spring Snow Flowering Crab (P.P 2667) – This new, hardy flowering crab is completely covered with flowers in the spring, but DOES NOT SET ANY FRUIT. It makes a shapely rounded tree 15 to 18 feet tall with attractive, bright green foliage, a perfect background for the lovely white flowers. 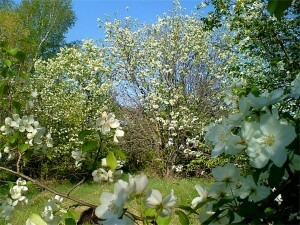 There is no other white flowering crab like it, so unique we have it patented. With this Sterile Crab, Spring Snow, you can enjoy the beautiful flowers without the fruit that other crabs produce. Originated in Canada by A. J. Porter. An original Spring Snow flowering crab is growing at the nursery and is a sight to behold in the spring when it is in full bloom. Thanks to the work of Darryl Fehr of Little Tree Nursery (Martensville) this tree is for sale at Honeywood.